A road sign in Kent, reminding traffic to drive on the left. Only about a quarter of the world drive on the left hand side. It may seem very strange to the rest of the world but it is deemed perfectly normal to those that live in the UK. 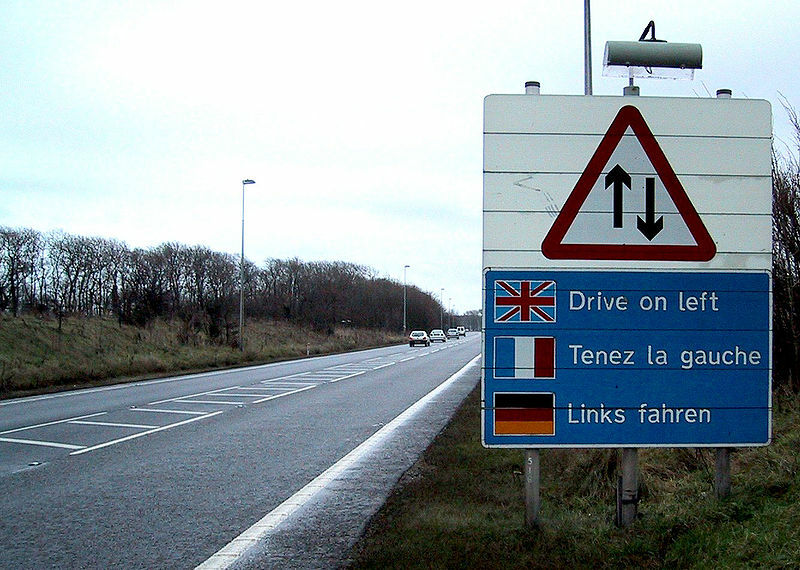 Someone curiously asked me “Why do Britons drive on the left?” To be honest I had no idea, I am not a walking Wikipedia, but it surely could help right-handed drivers get accustomed to driving in Britain. Do not bring a stop to an adventurous trip in Britain for your fear of colliding into some unknown being while behind the wheel. Driving in Britain is easy and enjoyable as long you learn the basics and follow the traffic regulations/sign posts. For many people, shifting their steering seat from the right hand side to the left seems like a grave vertigo problem. The first step in overcoming it is choosing the right vehicle model. Sometime it cuts you deep in the pocket, but comfort matters more. It is much better to organise car insurance right away, taking tips from friends, car rental companies, etc as to which is suitable. Before speeding away, I would personally recommend taking some driving lessons, as they would prepare you in navigating around roundabouts and other tricky junctions. Driving lessons give you the jumpstart, but practice is what counts and lots of it..
Talking about car insurance, beware of which one you choose. Many times you may be charged from your credit card until the insurance claim is settled. Also, check your car for damages before renting it. Take practice lessons on quiet roads. Reversing around a corner can be difficult as you must remember to reverse into a side road on your left. Check for traffic and parking regulations for more information. If you have an international license, it guarantees a year of driving in Britain after which you will have to apply for a British license. I would not recommend first timer’s to drive on the roads of central London, as there are many one-way systems that can be puzzling as well as bus lanes which must be avoided at certain times. . Taking any kind of public transportation is advisable as it guarantees that you will reach your destination on time and safely. Then there are the complicated & confusing roundabouts. A roundabout is a clockwise traffic circle designed to keep the vehicle flow constant. While driving around a roundabout remember never to enter it by taking a right turn, also be well prepared about your exit of choice and always remember to give way to traffic on your right. Practice makes perfect and in a few weeks time you will pull off the art of left-hand driving. Best of luck! This entry was posted on Wednesday, June 30th, 2010 at 4:03 am	and is filed under Uncategorized. You can follow any responses to this entry through the RSS 2.0 feed. You can leave a response, or trackback from your own site.